AQRate is a group of private companies that strives to be the market leader in terms of service, quality, innovation and operational expertise. We were established in 2003 to meet the corporate sector’s need for a credible empowerment rating agency with national representation. We have a proud history in the industry, having been one of the founding members of Association of BEE Verification Agencies (ABVA). AQRate Verification Services provides exceptional service to clients throughout South Africa AQRate (Pty) Ltd and AQRate KZN (Pty) Ltd accounted for 2 out of the first 11 verification agencies that were initially accredited by the DTI in 2009. Our national presence affords us the market presence associated with a true market leader. AQRate was also one of the 1st Verification Agencies to attain approval as Verification professionals with IRBA. The maintenance of this dual accreditation approval status talks to our commitment to the highest standards of professionalism and ethicacy. Our experience, professional expertise and specialized Broad-Based Black Economic Empowerment (B-BBEE) knowledge have gained us the respect of our peers in industry and government, earning us recognition as industry authorities and commentators on B-BBEE. Official recognition of this came when we were recently rated the no. 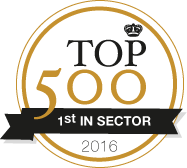 1 BEE Verification Agency in the country for the years 2013 & 2014 and again for 2015 & 2016 by the prestigious Top500 Companies Survey. AQRate has distinguished itself as a leader in the verification of large corporate and listed entities and are regularly sub-contracted by the other accredited verification agencies. We are the Verification Agency for more of the Top 100 listed companies on the JSE than any of our competitors. As such we have also been engaged by the JSE to oversee the methodology in the analysis of the black ownership in the Top 100 listed companies on the JSE. As part of phase 2 of this project AQRate have been tasked with verifying the methodology and findings of a pioneering study into the black ownership of mandated investments in South Africa. This makes AQRate the only verification agency in the country able to verify this component of ownership – a significant differentiator from our competitors. Of the 6 Academic publications on B-BBEE, 3 comes out of AQRate. 2 of these are by Lexis Nexis: “Empowermentor” a loose-leaf publication and “The Practical Guide to the Amended B-BBEE Codes of Good Practice”. The third is a JUTA publication called the “B-BBEE Scorecard Manual”. AQRate has also been commissioned to assist with the drafting of some of the sector codes and amendments thereto. The ABVA Best Practice notes on interpretation was also an initiative lead by AQRate. Chris van Wyk (AQRate CEO) has published two publications on the BEE, The Black Economic Scorecard Manual (Juta) and Empowermentor (Lexis Nexis) and is regularly consulted by other BEE professionals in South Africa. The Amended BEE Codes provides for businesses with turnover up to R10m to be rated as Excempt Micro Enterprises. (EME’s). You now only need an Affidavit to confirm your business' annual turnover and black ownership status if you are an EME. Compiling an Affidavit for BEE purposes is however not always as straightforward as it seems. We developed an online BEE Affidavit Generator to guide users through a series of questions to issue an affidavit that includes all the required information. Visit BEE Affidavits for more information. "AQRate always adheres to the agreed service level agreements ensuring that reports are delivered within agreed timelines. Their consultants are prompt in addressing queries and always rever if they are unable to assist with the requested information." "Tongaat Hulett has utilized the services of AQRate for the past three years. I have found them to be professional and results driven at all times and would recommend them to other companies looking for BBBEE verification." "They treated us like we were their only client and ensured that, as part of the audit, we had a full understanding of the various processes, adding value insight and value to the Steinhoff team." "We have been in a working relationship with AQRate. As a leader in the industry with respect to verification, we are very happy and satisfied with the service we have received from AQRate. The verification consultants are very professional,friendly and accommodating. They provide us with a clear verification plan and a complete list of activities to take place during the verification. "It was such a wonderful experience to have worked with an Auditing firm of your caliber, I am grateful to have partnered with AQRate for our BB-BEE Audit." "We have no hesitation in recommending AQRate. Their services are delivered with the highest degree of professionalism and quality. Their team was available, understanding and competent in dealing with all the matters arising in the audit. It was a pleasure working with them." "AQRate's professional expertise and its committed engagement with the Sanlam Group for BEE verification purposes inform our ongoing relationship. We continue to place a high value on the service and honest feedback we receive from AQRate."